Ko Tao (also often Koh Tao) is an island in Thailand and forms part of the Chumphon Archipelago on the western shore of the the Gulf of Thailand. The island was named by its first settlers after the island's turtle-like shape. Coincidentally, the island is an important breeding ground for hawksbill and green turtles. The island is well known for scuba diving and snorkeling, as well as hiking, rock climbing, and bouldering. The most popular place for tourists is Sairee on the west coast, which has a white sandy beach of 1.7 km interrupted only by a few huge boulders and a scattering of medium budget resorts and restaurants. Chalok Baan Khao, to the south of the island, is becoming increasingly popular as an alternative for those wishing to escape the crowds. A great many granite boulders, both in the forests and on the beaches of Ko Tao, attract a growing number of climbers. Pariya Resort & Villas Koh Pha Ngan The landscape surrounding the Pariya Resort & Villas Koh Pha Ngan is defined by lush tropical vegetation, rolling green hills and mountains, cobalt-blue sea and white sand beaches. In short, it is a holidaymakers' dream destination. Sunset Cove Resort If you want quiet and nice, if you want simple and cost-friendly, think Sunset Cove in Koh Phangan, Thailand. 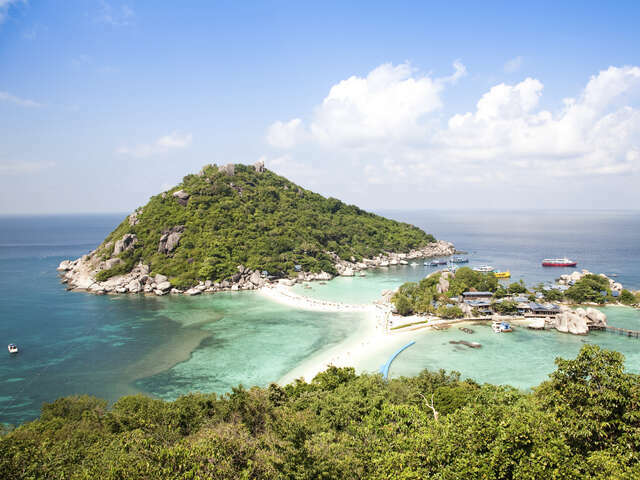 It offers you a chance at the delights of the beach life, and yet remains the little quaint Thai village that always leaves one's heart mellow.